Propylene prices witnessed a drop in some parts of Asia last week. On Friday, CFR South East Asia prices of propylene were assessed down at the USD 695/mt levels, a week on week fall of USD 10/mt. CFR China prices of propylene were assessed at the USD 740/mt levels, a decline of USD 5/mt from the previous week. Prices dropped mainly on account a sharp fall in upstream energy values and softer buying action witnessed in the region. In plant news, Formosa has shut its cracker on July 29, 2016 for a maintenance turnaround. The cracker is likely to remain shut for around 45-50 days. 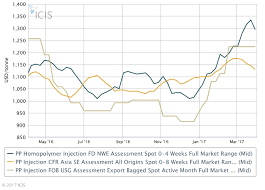 Located at Mailiao, Taiwan, the cracker has an ethylene capacity of 1.3 mmt/year and propylene capacity of 515,000 mt/year.FOB Korea propylene prices were assessed flat from last week at the USD 700/mt levels while CFR Taiwan prices of propylene were stable at the USD 745/mt levels. In other plant news, Shell has resumed production at its cracker in the 2nd week of July 2016. The company halted operations at its cracker in end-November 2015. The cracker was taken offline owing to a technical glitch. Located at Bukom Island in Singapore, the cracker has an ethylene production capacity of 960,000 mt/year and propylene capacity of 540,000 mt/year. Mitsubishi Chemical has restarted its cracker on July 14, 2016. The cracker was taken off-stream for planed maintenance on May 9, 2016. As per the original schedule, the cracker was to resume production in early-July 2016. Located at Kashima in Japan, the cracker has an ethylene production capacity of 540,000 mt/year and a propylene capacity of 260,000 mt/year.